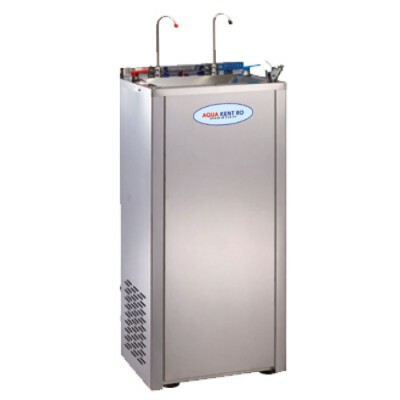 A high capacity, heavy duty water cooler with cold and normal temperature controller water dispenser. The built-in double 10" filter housings ensures that this floor-standing models ensures fast compressor cooling, making it robust and reliable. The Stainless Steel Economy Water Cooler is connected to the water mains, guaranteeing constant quality over time and requiring extremely limited maintenance, providing a reliable drinking water system for public areas, factories, waiting rooms, schools and shopping centres. Built-in water filter housings positioned in the base of the unit for easy access and servicing give one the option of easily purifying the incoming water using Aqua Kent 10” filter and purification cartridges available easily from us. *Filter cartridges included – Polypropylene sediment filter and granular activated carbon filter. Own the Malaysia's Hottest Selling Item, with rental options, free delivery and installations available.